One of the most exciting and dramatic events that happened during my time at Fulmer was the part played by our spectroscopist Douglas (Nick) Nicholas in the Trial. Many books and films have been produced about the robbery which happened 55 years ago but these have strayed from the actual evidence in order to make a more entertaining story. In contrast, this article is based on sources relating to factual evidence of the case with particular reference to our expert involvement with the Defence case for Douglas Gordon Goody. This article is addressed to those interested in the robbery but not necessarily experts in chemistry. For those interested in more detailed chemical evidence, it will be necessary to read the Court papers kept at the National Archives. At 3.03 a.m. on 8 August 1963, the Royal Mail train from Glasgow to Euston was stopped by armed robbers at Sears Crossing near Linslade in Buckinghamshire. By the end of the ensuing trial twenty men had received sentences amounting to 307 years and the amount successfully stolen remains at the equivalent of today’s value of around 50 million pounds. The train never arrived at Euston and the story of the robbery; the investigation and the trial are still subjects for speculation and discussion. The Trial started at the Crown Court at Aylesbury on 20th January 1964 under Mr Justice Edmund Davies and lasted 51 days. The charge was: that the twenty alleged persons on diverse days unknown between the 1st day of May 1963, and the 9th day of August 1963, in the County of Buckinghamshire conspired together with other persons unknown to stop a mail train with intent to rob the said mail train. Against the Peace of the Sovereign Lady the Queen, Her Crown and Dignity. 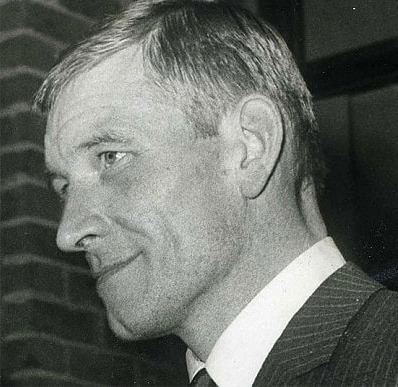 This article particularly focuses on Douglas Gordon Goody, one of the chief suspects of the robbery and the part that Fulmer played in his defence. A major piece of evidence against Goody related to a pair of his shoes. Goody’s Counsel decided to contest the evidence and several independent consultants were chosen to check the statements put forward by the Prosecution, namely. The Defence Counsel considered that it would be important to repeat the work of the Government Forensic Science Services that had concluded that the paint on Goody’s shoes was the same as that found on vehicles that had been painted at the farm. 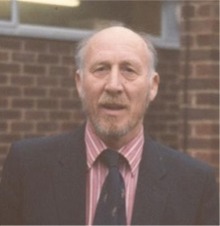 We were one of the expert witnesses chosen by Goody’s Defence Counsel since our laboratory offered expertise in spectroscopic analysis led by Douglas Nicholas, known to us all as Nick. On the day of the spectroscopic examination three police cars and motorbike outriders entered the drive to the front of the Country House of the Fulmer Research Institute. With great care a box containing the shoes, was taken into the laboratory. 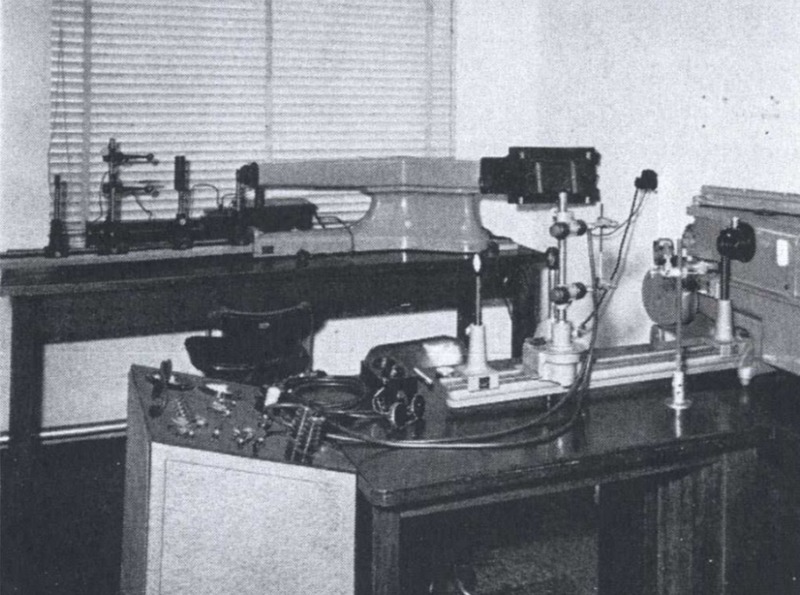 Members of the Defence and Prosecution Counsels were shown into the small Spectroscopic Laboratory on the second floor together with the box containing ‘Goody’s two shoes’ as they became known, where there was installed a Hilger Spark spectrograph. Nick took a small sample of paint from the shoes and placed it in a small cupped carbon electrode and another electrode of the opposite pole gently lowered just above the specimen. The current was turned on for the required time and the whole room filled with light generated from the spark. An identical procedure was carried out on samples of paint taken from the farm. Before starting the analysis, a glass photographic plate was loaded into the spectrograph to record the spectrum. Then the spectrographic plate needed to be chemically developed in dark room, which unfortunately was rather small. Nick, followed by members of the Defence and Prosecution Counsels, squeezed into the tiny Dark Room but then it was realised that the light had to be turned off to develop the photographic plate; just who and how the decision was made that this would not prejudice them observing the analytical procedure is unclear. In due course the Court party left carrying the shoes in the box and Nick was left to interpret the photographic plates. Nick confirmed that the previous evidence against Goody given by FSS was correct when they said that the paint samples had many lines on the photographic plate in common that formed the basis of their evidence. It was now down to Nick to interpret the composition of the paint samples in Court, been taken in the presence of the Prosecution and Defence Counsels when they visited his laboratory. Nick explained that when the photographic plate is exposed to the spectrographic test, lines are produced on the plate and each of the many lines is characteristic of a particular chemical element. In the case of the paint samples that came from both the farm and the shoes they contained chromium that generates many lines that are the same. The same principle applied to other elements found in the paint samples. However, Nick found that his results were not identical to those from the FSS. A protracted discussion about the spectroscopic evidence followed between the Defence and Prosecution. This became very difficult for a lay Jury to follow. But in the mind of the Judge there was a doubt about the paint samples being identical. Giving evidence in Court relating to scientific or technical matters was part of the job of colleagues at Fulmer. This was not a typical trial that we would attend but one of the greatest criminal cases in modern times. Added to which the evidence that Nick gave was delivered in the presence of one of the most charismatic and professional criminals in the land; evidence that could affect the sentence that Goody would be given. For all of you who still remember Nick I am sure you would take off your hats to him for his professionalism through a very tough experience.